There aren’t too many brands that think beyond selling products and earning a profit. TOMS seems to be one of the few companies that place more value on social responsibility than dollar signs. The for-profit company based in Playa Del Rey is known not just for its comfortable alpargata-styled shoes, but also for its inspiring mission and charitable outreach. Did you know that you can also donate your shoes directly to charitable organizations? TOMS operates by the mission statement “for every pair you purchase, TOMS will give a pair to a child in need. 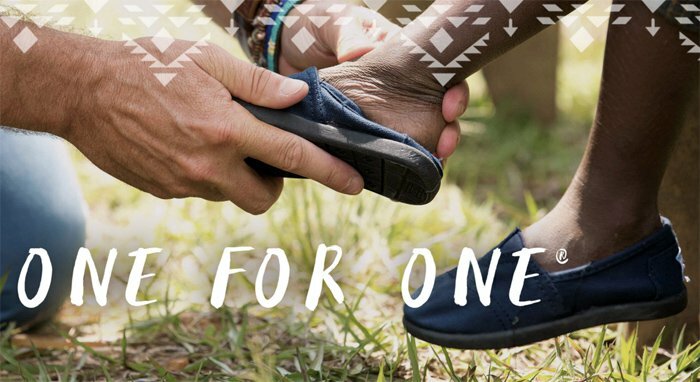 One for One.” The brand has also expanded its “One for One” mission in order to provide safe water to impoverished communities. Even celebrities like Jessica Alba, Sarah Hyland, and Emma Stone are fans of the brand. To support this cause, it is important to purchase authentic TOMS shoes. When buying online, always be on the lookout for scammers offering “discounted TOMS” on unauthorized websites. Shopping sites like eBay may display low prices for these items, but that’s because a lot of sellers are selling counterfeit TOMS. If you decide to buy TOMS from an unauthorized retailer or settle for second-hand items, it is very important to do a little digging first. There are several sellers that claim to stock authentic goods, but really only have fake items. Make sure to check reviews and inspect the website first. If you come across negative reviews or dubious claims, find another store with a better reputation. Make sure to watch the below video of Katie Patton, who had the unfortunate experience of purchasing a pair of fake TOMS on eBay. All TOMS shoes come packaged in eco-friendly and recycled materials because of the brand’s commitment to the environment. An authentic TOMS shoe box should include a canvas bag designed with the TOMS flag and a TOMS sticker. The design or print of the shoe box may change periodically, depending on the season or style of the shoe that you purchase. A lot of fake TOMS have “Made in China” printed on their tags, located on the outer right part of the shoe. 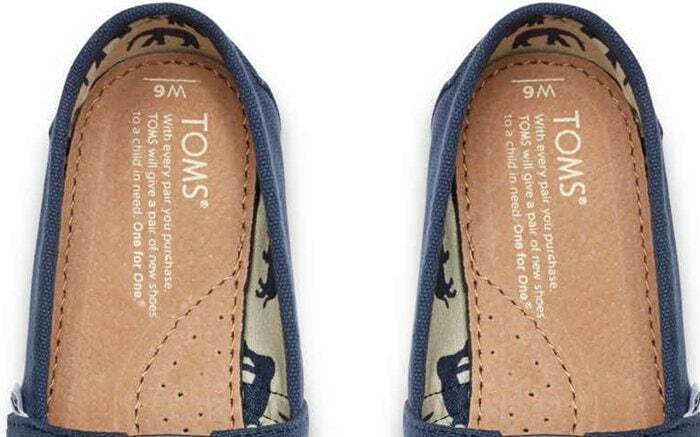 Original TOMS shoes are made in Haiti, China, Ethiopia, and Argentina, but this is not indicated or printed on any part of the shoe. The company has committed to producing one-third of their shoes in the regions where they are donated. Since local production helps to build industry and create jobs and sustainable futures, it makes us wonder why they don’t commit to manufacturing 100% of their shoes in these countries. The small tag should only be printed with the brand TOMS and nothing else. Also, note that these tags should lay flat on the shoe and should not be sticking out from behind. Authentic TOMS shoes run true to size and stretch lightly when broken in. Fake ones, on the other hand, are oftentimes too short because of the different and low-quality materials used in production. You can check the sizing by comparing your newly-bought TOMS with other shoes in your closet. 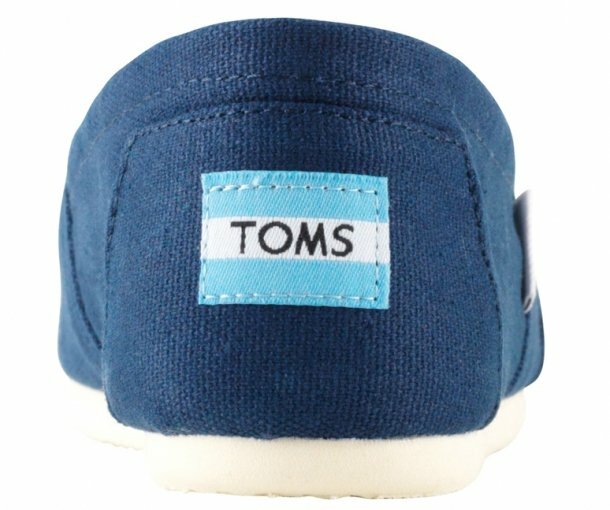 The logo of a genuine TOMS pair should be placed halfway on the back heel part, with even stitches around the flag. 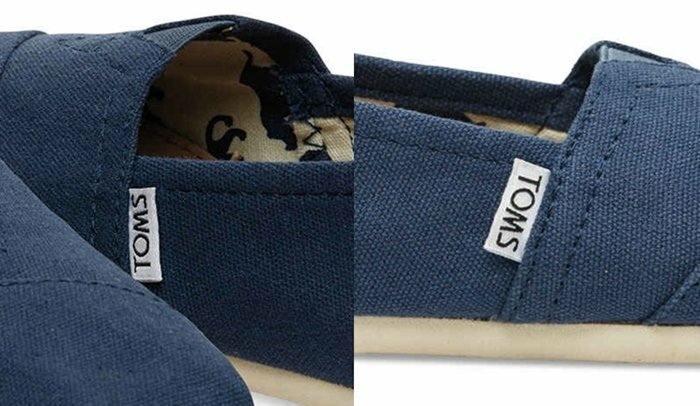 Fake TOMS typically have logos that are too low or too high, with very uneven stitching. One of the surest ways to check for fake TOMS is through its insoles. If the inside soles can be removed, then they are most likely imitations. The insoles of genuine TOMS shoes, regardless of the style, are sewn in the soles and not glued! They do not slide off and definitely can’t be removed. The soles should also have arch support and cushioning. Fake ones will have flat insoles that do not give any support or cushioning for your feet. These will feel uncomfortable when worn. The outsoles of original TOMS have a light, textured pattern and are easily bendable even when they are new. Fakes will feel really thick and stiff, and cannot be flexed. Authentic TOMS typically use printed linings on their shoes. The graphic prints of the lining differ depending on the color and style of the shoe. A lot of fakes have very poor quality inside linings with the same prints on different styles of TOMS. Some do not even have graphic patterns, which is not very common for real TOMS. To be sure, compare them with the styles posted on the TOMS website. Take note that there are more lining designs on the women’s collections. Most of the men’s styles have simple inside prints, while some men’s TOMS shoes do not have any inside prints at all. The insoles display the TOMS mission statement – “With every pair you purchase, TOMS will give a pair of new shoes to a child in need. One for One.” One of the telltale signs of fake shoes is badly printed text, uneven lines, and misspellings. Be on the lookout for these little signs as well as the spacing on the text print. The font used throughout the whole text should match the font of the TOMS brand. Fake shoes come in all types of styles, some with strange and really tacky designs. Sellers can even tag these shoes as “limited editions” or “rare finds” to fool you. It is always better to verify the style on the TOMS website first. Typically, the most imitated styles are the classic canvas TOMS because they are easiest to manufacture and also because they are the most popular styles. 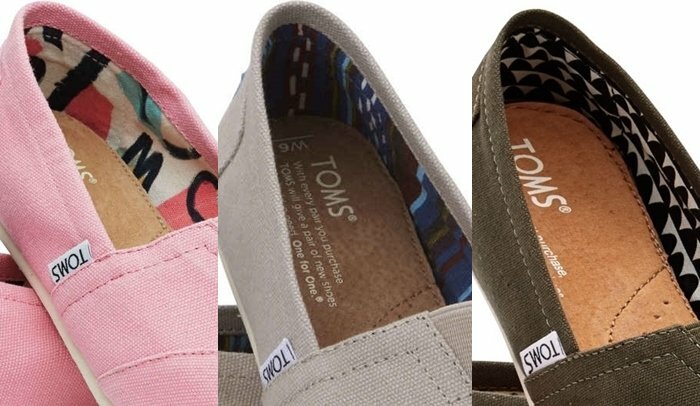 Always double check and compare the style with product photos from the TOMS website or other authorized retail stores online. Aside from the worthy advocacy, TOMS shoes are known for another thing — they are super comfortable on the feet. Real TOMS should feel comfortable when worn. They boast soft canvas uppers, arch support, and bendy soles. Fake TOMS often look and feel stiff because they are manufactured with cheaper materials. If they feel weird and too rigid on your feet, then they are probably counterfeit.